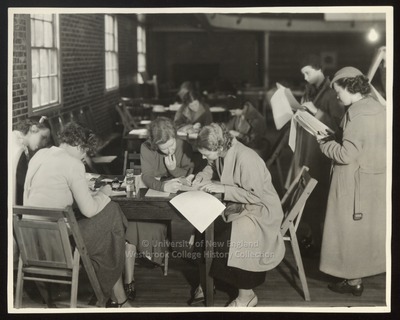 "Registration Day, Westbrook Junior College, 1934"
Westbrook Junior College students fill out their registration forms within the gymnasium on September 18th, 1934, in this black & white photograph. Some girls stand while others sit in wooden folding chairs at small wooden tables. Students are filling out their multi-page registration forms with fountain pens and Skrip ink. Several wear long woolen coats; others have removed their coats to reveal three-quarter length dresses and suits, most with cuban heeled shoes. All wear hair-dos of soft finger waves and curls. Intent upon what they are doing, the camera is ignored.